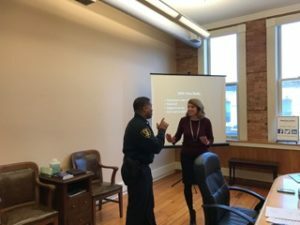 This training program is specifically geared for the law enforcement professional with customized, focused training that will help participants improve their communication skills in various situations like impromptu speaking, formal presentations, and courtroom testimony. CLICK HERE to learn more and register for our next Boot Camp. This Boot Camp is a workshop training that happens three times a year in the Chicagoland area. Seats are limited so register ASAP if interested. If you would rather invite Meg into your department for this training, she’d love it! Simply shoot her an email (meg@megbucaro.com) or text 847.691.8119) to explore the possibility.